My setup is a little bit complicated and I'm almost sure that my problem is port related. So I'm running Mac OS X 10.13.4 with Parallels Desktop with a Ubuntu 14.04 VM. I managed to setup bitcoin core in the VM, on top of it I installed c-lightning and managed to fund it with btc (All is happening on the testnet) which I used to open one channel with some random other node. Everything is perfect for now. Because I want to use the LApp for WordPress Lightning-Publisher I Installed lightning-charge and started an HTTP server running on the default port 9112. All of my ports are correctly forwarded and in my bitcoin.conf file I have allowed all ips. 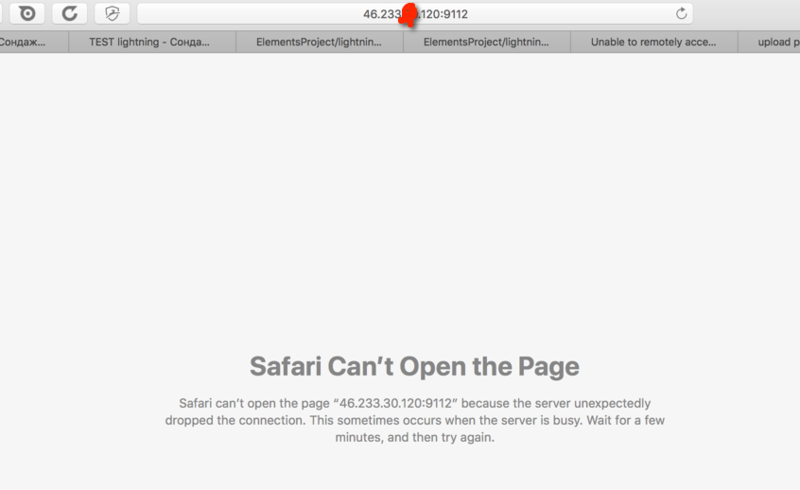 If I run Mozilla in my Ubuntu VM and go to http://api-token:mySecretToken@localhost:9112/info everything is fine, but when I try this on my Mac I get Can't open the page because the server unexpectedly dropped the connection. If I try using my external ip it's the same thing. Using several sites to check if my ports are correctly forwarded I get that all corresponding ports are open (18332 for BTC core, 9735 for c-lightning and 9112 for lightning-charge). After a lot of research I found the solution to my problem. I didn't know this, but in nodejs there's a huge difference if your server runs on 127.0.0.1 and on 0.0.0.0. It isn't said in the lightning-charge docs, but except the --port attribute you also have --host which you can set. Starting lightning-charge with this line charged --api-token mySecretToken --host 0.0.0.0 fixed all of my problems. Gosh was that an unpleasant journey! Not the answer you're looking for? Browse other questions tagged bitcoin-core lightning-network c-lightning or ask your own question.